Celebrate a job well done with our Personalized Freedom Eagle Marble Award, customizable with a single logo imprint. 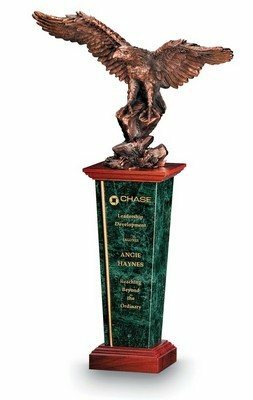 A striking depiction of magnificence and splendor, Freedom Eagle features the American bald eagle in all its glory, atop an attractive award column. The eye-catching sculpture represents leadership qualities that are at their zenith. Each eagle is finished with copper plating over cast resin, which highlights its artistic details in abundance. These regal and powerful sculptures are the best way to appreciate outstanding character and achievements that exceed expectations.The award ensures a grandeur presence at award functions, boosting recipient morale and brand visibility.